Why the ‘Big Falcon Rocket’ SpaceX changed their name to ‘Starship’? The name of the gigantic spaceship SpaceX known as the Big Falcon Rocket (BFR) was inspired in his great size and a hawk. But now, it has a new name that reveals part of his mission: the rocket will be called “Starship”, which can be translated as “Stellar”, and wants to take people to Mars starting in the year 2022. Elon Musk, founder of SpaceX, revealed the name change on Twitter this week, with a message that simply said: “Rename BFR as a Starship“. In a publication of the tracking, explained that, technically, Starship consists of two parts: The spacecraft from the upper, called Starship, and Super Heavy, the rocket need to give it enough momentum to escape the gravity of the Earth. There was no reason for the change, but his new nickname in the style of Star Trek may respond to the ambition of the project. After announcing the change, a follower of Musk intervened to observe that, “unless this starship is sent on a mission to another star system, it cannot be called Stellar”. Almost immediately, Musk replied that “the later versions will.” If we take into account that the star system is the closest system is Alpha Centauri, about 4.3 light years, or 25.8 trillion (25,800 million) miles from Earth, that it is a prospectus rather optimistic. Designed with the aim of carrying astronauts to Mars, the Big Falcon Rocket (or better said, the Starship) promises to be the rocket bigger and more powerful built up the moment in the history of mankind, and states that it will be able to carry about a hundred people on each trip. Although it is still not built, the ship of 350 feet will be 10.8 million pounds of thrust power, which is equivalent to ten times the thrust produced by the rocket Falcon 9 that SpaceX uses regularly to their releases. And like all other rockets of SpaceX, is designed to be reusable. 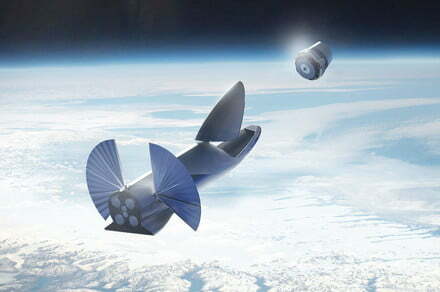 SpaceX plans to test the first prototypes of his Starship in the earth’s atmosphere the next year. As long as these first tests are going well, then you are expected to be able to perform a test orbital in the year 2020, before deciding to carry out a possible flight to Mars, which could take place in the year 2022. At least, those are the plans, but of course there is no way to know if SpaceX will be able to stick to that calendar.